WHAT THEY ASKED FOR: Carly asked if it was possible to have a picture of her husband drawn as a super hero as a Christmas present from her children. WHAT THEY GOT: This was a fun picture to draw. I was worried at first because there was only one reference image and it was quite small, but in the end I think it pulled together quite well with the bright red and blue ‘Super-Dad’ costume! LIKE IT OR NOT: Thank you Ashley Slater you did an awesome job! 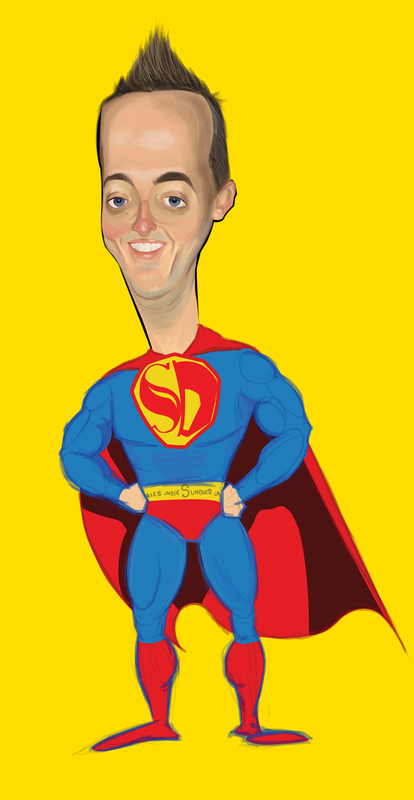 GET YOUR OWN: If you’d like a caricature of your own why not get plucky and enter the lucky dip!